You are currently here! » Home » Delhi Shop » Capri Store Pvt. Ltd. It is a 50 year old store. The owners started making radios and later ventured into manufacturing toys and bags. Today, they concentrate on manufacturing and stocking a variety of travel luggage & bags. It is a popular handbag store in SN Market (Sarojini Nagar ). School bags with Barbie and Disney themes, gym bags and swimming bags that are easily washable are available. Further, overnight-er and travel bags in polyester are available. They would cost Rs. 1000- 2000/piece. Sturdy rucksacks that for ideal for use in trekking are also available, costing, between Rs. 1500 – Rs. 2000/piece. Working women’s handbags, multipurpose ladies canvas bags, mother bags to store feeding bottles and baby essentials & lunch bags are all available. They would cost anywhere between Rs. 1000- 1600/piece. 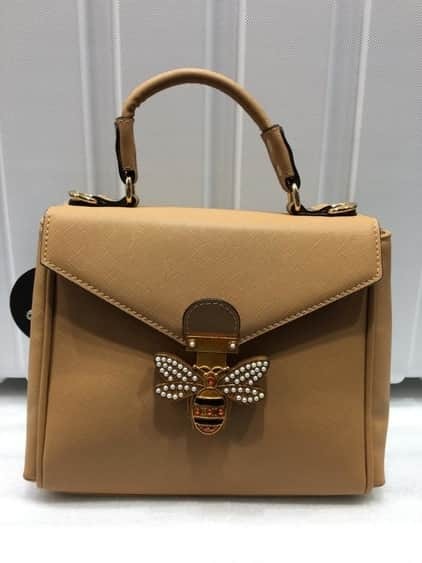 A huge stock of ladies bags that are made from PU(poly urethane) or from pure leather, ladies handbags and sling bags are all available in a variety of shapes, sizes and colors as well as office bags in pure leather. These bags have several compartments and are ideal to store documents, iPad, mobile phones and other office essentials and cost approximately Rs. 4000/piece. There are non leather handbags and sling bags that would cost Rs. 1500 to 2500/piece. These bags are available at Rs 1500/piece. Other international brands of handbags in leather are also available the store. These are typically made in India with ornate gold & bead work and would cost Rs. 1500 /1600/piece. While the ground floor is given over to bags and handbags, the first floor has a huge stock of travel luggage and laptop bags. Trolley bags in pure leather and hard luggage in PU material are available. The laptop bags in leather look elegant and light. The luggage section has a stock of American Tourister, Delsey, Swiss Gear & Sonnet luggage. The Capri store has a branch in the Vasant Kunj Market. Madame Sarojni Nagar shop is not part of one of those international chains where everything looks so alike and factory-made and, well, wholesale bulk! The tops, trousers, skirts and dresses all have a hand-picked look and feel. This does make the range limited, but the selection is exclusive. Cotton tops are priced between Rs. 850 and Rs. 1,200, each ,while dresses are priced at Rs.1,500 per piece The jeans range carries a price-tag of Rs. 1,700 plus. Most shirts and tees are in cotton while there is a range in spandex, viscose and cotton mix as well. A trendy collection of jackets and coats and a comfy line of nightwear make it a complete one stop lady’s shop. Accessories like belts, wallets, handbags are a stylish add-on. If you are young, on a budget and need a variety of clothes you can go to Madame Sarojni Nagar. You can also find the ‘Madame’ stores in several other markets.